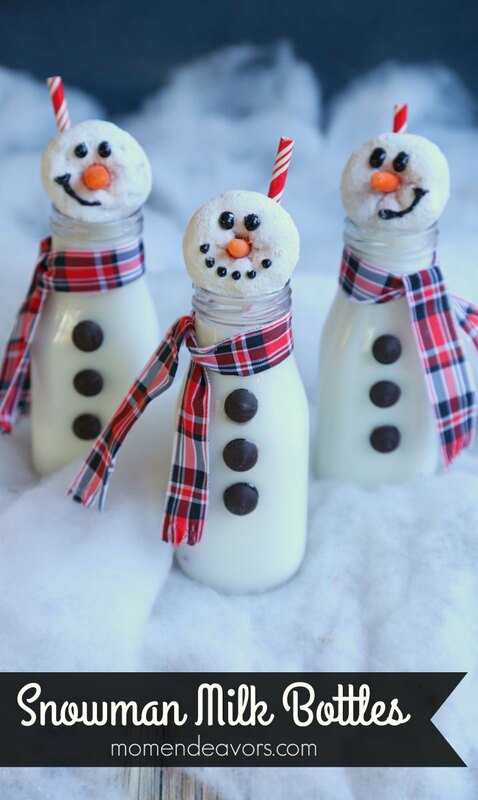 These cute snowman milk bottles make for an adorable & tasty holiday treat! ‘Tis the season for fun winter & Christmas ideas! Whether you’re looking for a cute Christmas Eve treat for Santa, a Christmas morning breakfast idea, a holiday party idea, or just a fun “anytime” treat for the kids during the winter months, this snowman snack is sure to be a hit. So, I’m thrilled to partner with sponsor DairyPure to bring you this fun & delicious recipe treat that’s backed by an exclusive Five-Point Purity Promise! And, when you’re thinking about treats for Santa (or for your kids), a Five-Point Purity Promise is a good thing! DairyPure milk contains no artificial growth hormones*, is tested for antibiotics, is continually quality tested to ensure purity, only comes from cows fed a healthy diet, and is cold shipped from your trusted dairy. 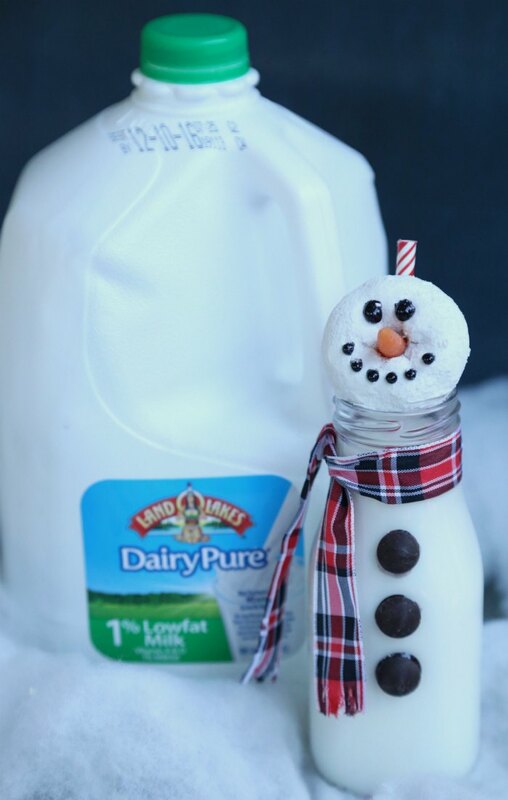 So, grab a gallon of DairyPure milk and make this fun snowman milk. I think it would be perfect for Santa! It also would be really adorable for your Christmas morning breakfast. We usually do a big breakfast spread in the morning and the kids would LOVE having these on the table! 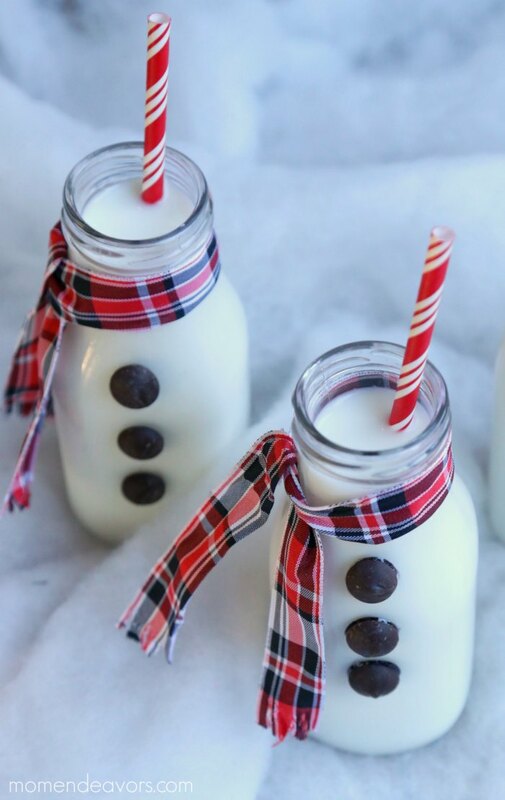 These snowman milk treats would also be PERFECT to make for a snowman book night. We LOVE the books Snowman at Night and Snowman at Christmas. 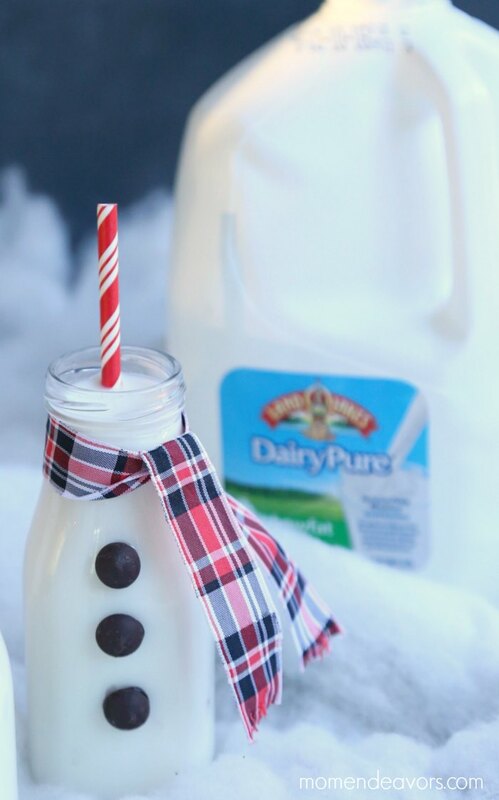 So, you could plan a fun little time to enjoy a tasty snowman milk snack while reading the books! So, you’ll start tying some ribbon around the bottle necks to look like a scarf! I even made some cuts to the end to make it look like fringe. You can use a little tape or glue to hold the ribbon scarf down if you’d like. Then, you’ll want to attach some chocolate chip buttons to the bottles. Melt a few chocolate chips. Allow the melted chocolate to cool just a bit (but not harden) and use that melted chocolate to stick the unmelted chocolate chips to the bottle. Fill the bottle with milk and add a straw! Easy peasy! SOOOoo cute! I love the simplicity of the bottles just like that. BUT…if you want a full treat idea, you can make full snowman! You’ll just make your snowman bottles as described above, but then you’ll also need small powdered sugar donuts, petite baby carrots (or small cut carrot sticks) and some chocolate or black frosting/icing for piping. Stick a small carrot in the small donut hole and pipe on a little face. 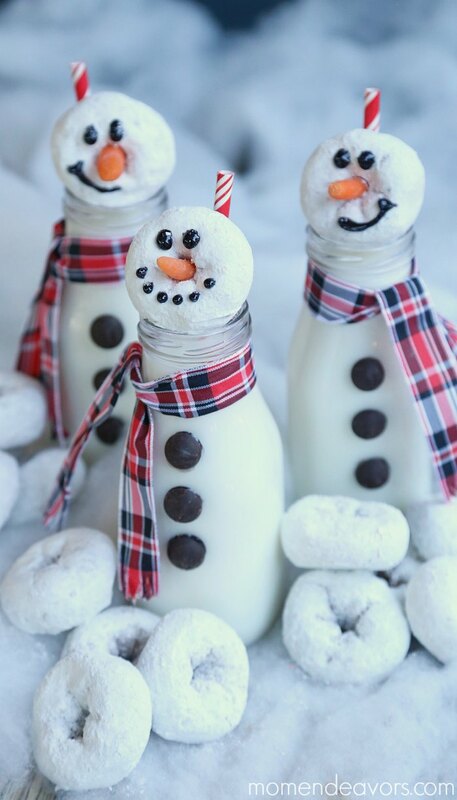 The snowman donut heads then can just sit right in the opening on the milk bottle (with the straw there for some extra support). I surprised the boys with these for a fun winter snack. But, I really think these would be PERFECT for Christmas morning or a cute Christmas Eve dessert!! LOVE! Aren’t they cute?! I love them!!!! So, grab your supplies and pick up some DairyPure milk in the dairy case at your local grocery store (it’s available nationwide in whole, 2% reduced fat, 1% low fat and skim/fat free milks). 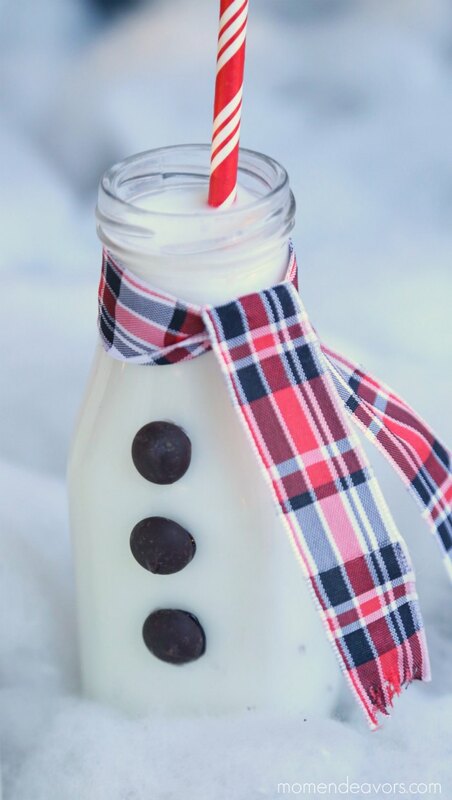 What are your favorite treats to go with milk at the holidays? For more recipes, local retailers, the full line of products and to learn more about DairyPure’s exclusive Five-Point Purity Promise, visit DairyPure.com! You can also find DairyPure on Facebook and Pinterest. Disclosure: This post is part of a sponsored campaign with DairyPure. All opinions and experiences are entirely my own.